The main goal for 2018 is to walk my golf rounds as often as possible, and ride as little as possible. I have several reasons. First, I need exercise. 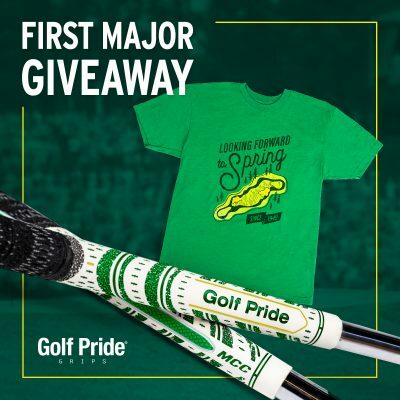 Second, I’m training for an epic trip to Bandon Dunes Golf Resort this July. Third, and not least, riding costs a lot more money. I’m saving about $15 per round by walking. Slinging my bag on my shoulders is not much of an option because I have a bad back. Thankfully I have a Big Max Blade Quattro 4-wheel push cart, or “trolley” for my friends across the pond. 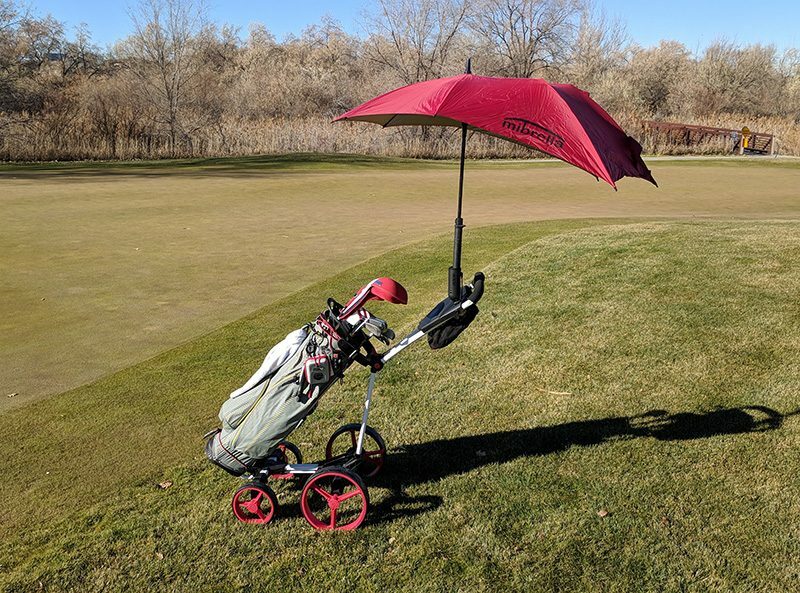 I’ve been gaming this push cart for six months now, 3x/week now that spring is here. The Blade Quattro features four wheels, which fold to a nice flat “blade” shape for storage, as seen in the photo below. The wheels can be removed easily for more storage and transportation options. 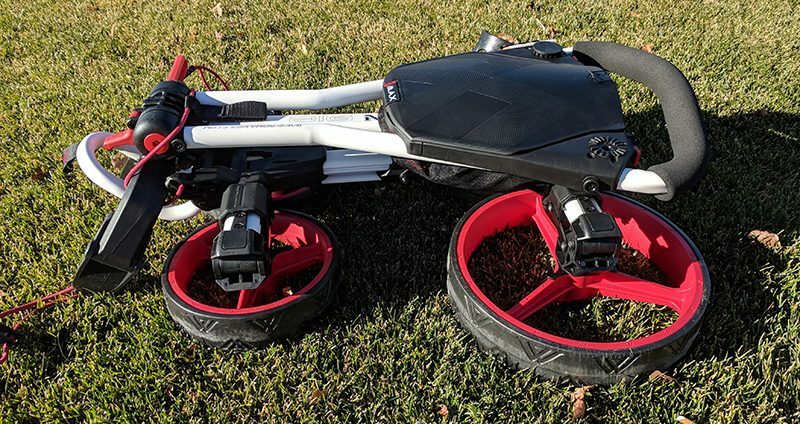 The frame is solid but the wheelbase is a little narrower and shorter than some carts, so balancing the bag properly is important for a good and easy roll. Folding is easy. Undo two latches, one being the height adjustment for the handle, and bring the frame together. The wheels automagically fold under as seen above. The handle area has some nice features. First there are mounts for GPS devices as well as an umbrella mount (see photo below with umbrella). There is a beverage holder on the right, which perfectly fits a water or sports bottle. The storage area in the handle is massive. I’ve put tons of stuff in there. 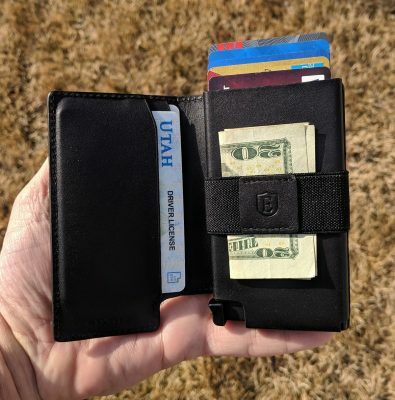 At one time I had the following in there, with plenty of room to spare: 4-5 balls, wallet, phone, gloves, hat extra score card, car keys, pocket camera, umbrella mount. See photo below. The lid of the storage compartment holds a scorecard with a strong clip. There are also a few tee holders and a pencil holder in the handle area. Here’s a little video showing the Blade do its thing, in spring golf conditions in Utah (meaning some snow on the ground). The Big Max Blade Quattro 4-Wheel Push Cart is a terrific push cart. I just wrapped up my 2nd round in as many days with the Blade, just about an hour ago. It was a solid round and I was once again thrilled with the Blade’s performance and convenience. She’s now folded nicely in the trunk of my car, ready for action on a moment’s notice. I need to capture some video of the folding action. The wheel’s automatically fold under when the user folds the frame. Very cool. I’m just starting my detailed review process, which of course means a lot of on-course evaluation. Stay tuned for my full review soon, lack of snow permitting here in northern Utah. Until then, enjoy one more shot of the Blade Quattro doing its thing. 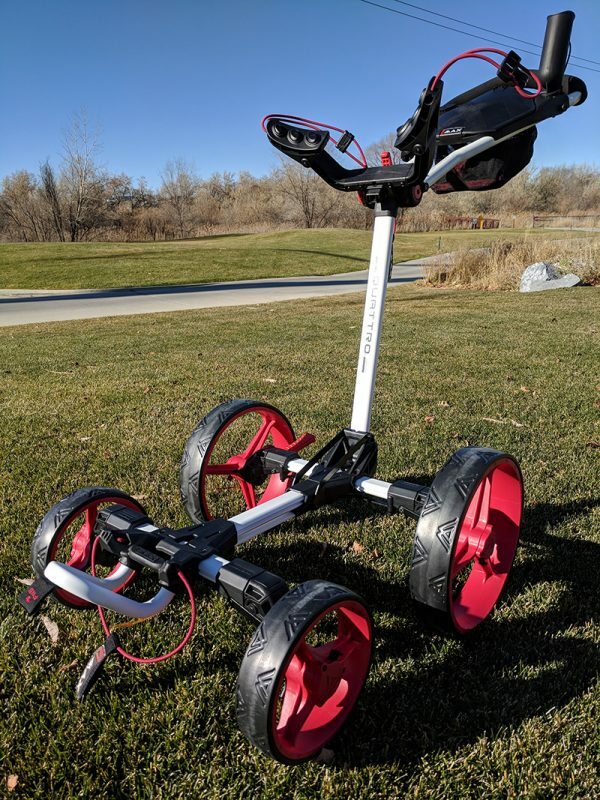 I thought I’d seen it all in golf gadgets and accessories, but until the GolferPal EasyPal auto-folding and unfolding 4-wheel push cart arrived I apparently had not! This is no regular 4-wheel golf push cart. Let’s take a look. Motorized automatic folding and unfolding. Before I get on course, let’s talk trunk to course. The unit is folded into a conveniently compact size at only about 13x17x26 inches. The trunk of my car is not big, but the cart fits fine along with my clubs. During the course of the round the EasyPal performs well. I have several 4-wheel push carts and it is just as easy to push as any other in my fleet (yes I have a fleet). I’ve played many rounds with this unit and still have yet to charge the battery. Obviously by the way, the battery needs to be charged before you can use it. I’ve used the umbrella mount in rain and it does a great job. I like to use it in the hot summer with a large umbrella to keep the sun off me. The accessory container is nice and big to hold the million things I seem to need to carry like my large cell phone, camera, golf pocket GPS, car keys, nutrition bars and so on. 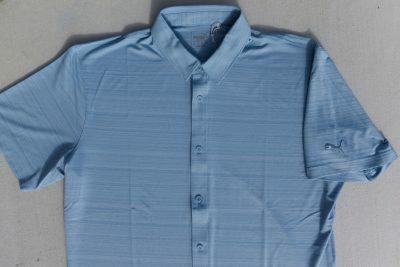 When done with the round the one-button process is all that is needed to fold the unit up. One push and it folds by itself and then easily stores in the trunk of the car. Obviously the auto folding and unfolding is a pro. The 4-wheel stability is a pro. The ease in which the unit glides over the fairways and even through some rough terrain is great. The accessory holder and scorecard holder are excellent. This is not a motorized push cart. Just the folding is automated. The handle position is a little high on the unit and can’t be repositioned due to the folding gig. I’d like the handle to be a little lower. I’m not that tall. Due to how narrow they are, the front wheels rub against the lower pockets in my golf bag. I have to remove the stuff from those pockets and push them down somehow to prevent the wheels from rubbing the bag. It is important to remember to put the BRAKE on when folding or unfolding. On a hill once I started the unfolding and the cart started rolling away. I’m sure I expended more energy chasing the cart than I would have if I had to manually unfold it! While unfolding this cart a gentleman in the parking lot at one of my local courses came over and inquired about it. He offered to buy it from me on the spot! There apparently is a demand for this type of thing! 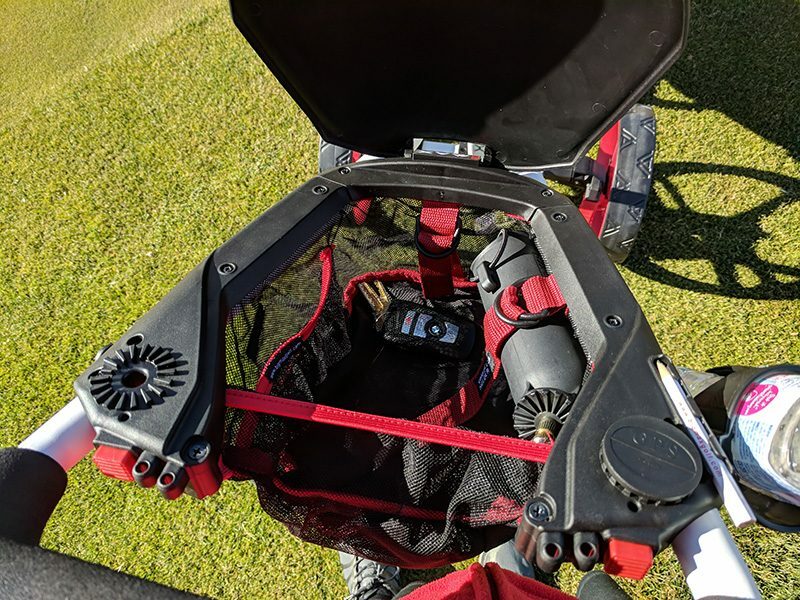 If you find your push cart to be inconvenient or too hard to fold or unfold, the GolferPal EasyPal just might be the answer for you. 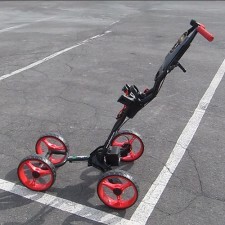 The awesome motorized features aside, it is a solid 4-wheel cart. The primary feature of the Racr is that it has four wheels, unlike 99.9% of the golf push carts out there with three. With the fourth wheel, the cart can have a level platform to mount the bag in a vertical position. 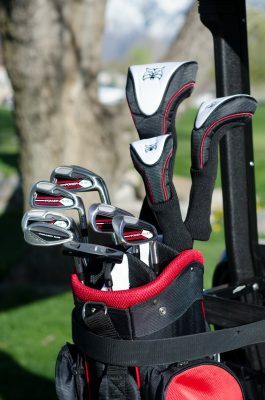 Having the bag in a vertical position is great because my clubs are much easier to remove and put back into the bag. The golf towels hanging from my bag hang nicely and don’t drag on the ground like they do with my 3-wheeled push cart. It is especially good to not have your towel dragging on the ground this time of year because of all the goose crap on the course.